This global view of Mars is composed of about 100 Viking Orbiter images. Oct. 10, 1960: Marsnik 1/Mars 1M No.1 (USSR) launched for an intended Mars flyby. The spacecraft was destroyed during the launch and failed to reach Earth orbit. Oct. 14, 1960: Marsnik 2/Mars 1M No. 2 (USSR) launched, also for an intended Mars flyby. But similarly to Mars 1M No. 1, the spacecraft exploded during the launch and did not reach Earth orbit. Oct. 24, 1962: Sputnik 22 (USSR) launched for an intended Mars flyby. The rocket that launched the spacecraft had a fatal issue and the spacecraft was destroyed soon after it achieved Earth orbit. Nov. 1, 1962: Mars 1 (USSR) launched for an intended Mars flyby. The spacecraft made it to Earth orbit and beyond. But almost five months later, on March 21, 1963, the spacecraft was 65.9 million miles (106 million kilometers) away from Earth when its radio failed and communication with the craft permanently ceased. Nov. 4, 1962: Sputnik 24 (USSR) launched for an intended Mars flyby. The spacecraft achieved Earth orbit but had a fatal issue when it changed its trajectory toward Mars and it eventually fell back to Earth, in pieces. Nov. 5, 1964: Mariner 3 (U.S.) launched for an intended Mars flyby. An hour after the launch, there was a problem with the solar panels. Ground crews were unable to fix the issue before the spacecraft's batteries died and the mission failed. While those first several missions didn't reach their target, NASA's Mariner 4 finally did. The spacecraft launched on Nov. 28, 1964, and was the first to fly by Mars on July 14, 1965. It sent 21 photos of the Red Planet back to Earth. Two days after Mariner 4 launched, the Soviet Union tried again with Zond 2. The spacecraft passed by Mars but the radio failed and it did not return any planetary data. NASA also sent Mariners 6 and 7 in 1969, both of which reached Mars and sent back a few dozen photos. Coincidentally, all of these spacecraft flew over areas of Mars that were cratered. This gave astronomers the false first impression that Mars looked like the moon. March 27, 1969: Mars 1969A (USSR) launched but was destroyed before reaching Earth orbit. April 2, 1969: Mars 1969B (USSR) failed during its attempted launch. May 8, 1971: Mariner 8 (U.S.) also failed during its attempted launch. May 10, 1971: Kosmos 419 (USSR) launched and achieved Earth orbit before suffering a fatal issue. Also in 1971, the Soviet Union finally met with success after several attempts to reach the Red Planet. Its Mars 2 orbiter, which launched May 19, 1971, arrived on Nov. 2. However, the Mars 2 lander crashed on the surface and was no longer operable. Mars 3, a lander and orbiter mission, launched on May 28, 1971, and arrived on the Red Planet Dec. 3. The lander worked for only a few seconds on the surface before failing, but the orbiter worked successfully. The image of Mars changed with the arrival of NASA's Mariner 9 in November 1971. The spacecraft, which launched on May 30, 1971, arrived at Mars when the entire planet was engulfed in a dust storm. What's more, something mysterious was poking above the plumes of dust. When the debris settled to the surface, scientists discovered those unusual features were the tops of dormant volcanoes. Mariner 9 also discovered a huge rift across the surface of Mars, later called Valles Marineris — after the spacecraft that discovered it. Mariner 9 spent nearly a year orbiting the Red Planet, and returned 7,329 photos. Valles Marineris, seen at an angle of 45 degrees to the surface in near-true colour and with four times vertical exaggeration. The image covers an area of 630 000 sq km with a ground resolution of 100 m per pixel. The digital terrain model was created from 20 individual HRSC orbits, and the colour data were generated from 12 orbit swaths. The largest portion of the canyon, which spans right across the image, is known as Melas Chasma. Candor Chasma is the connecting trough immediately to the north, with the small trough Ophir Chasma beyond. Hebes Chasma can be seen in the far top left of the image. July 21, 1973: Mars 4 (USSR) launched and then flew by Mars on Feb. 10, 1974, but that wasn't the plan; it was intended to orbit the planet, not keep going. July 25, 1973: Mars 5 (USSR) launched and settled into orbit around Mars on Feb. 12, 1974, but lasted only a few days. Aug. 5, 1973: Mars 6 (USSR) launched with a flyby module and lander that arrived at the Red Planet on March 3, 1974, but the lander was destroyed upon impact. Aug. 9, 1973: Mars 7 (USSR) launched again with a flyby module and lander, and arrived at the Red Planet on March 3, 1974, but the lander missed the planet. Meanwhile, NASA sent two pairs of orbiters and landers toward Mars in 1975. Viking 1 and Viking 2 both arrived at the Red Planet in 1976, and sent their lander to the surface while the orbiter remained working above. The Viking program represented the first extended exploration of Mars, as each spacecraft lasted years and transmitted reams of information back to Earth. 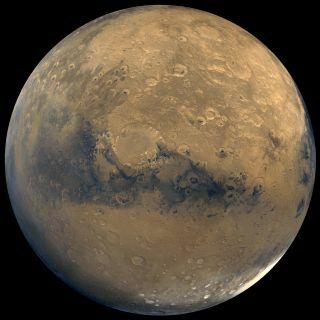 The Viking missions also revealed that the composition of Mars was almost identical to certain meteorites found on Earth. This suggested that some meteorites found on Earth were originally from Mars. The Soviet Union also made two attempts to reach one of the moons of Mars, Phobos, in the 1980s, but both missions failed. This color picture of the Martian horizon was taken by Viking 1 on July 24, 1976. NASA's next attempt to reach the Red Planet came in the 1990s, when Mars Observer launched to the planet on Sept. 25, 1992. The spacecraft was lost just before it was supposed to achieve Mars orbit on Aug. 21, 1993. While the loss of communication was never fully explained, the most likely cause was a fuel tank rupture that caused the spacecraft to spin and lose contact with Earth. The loss was especially painful because the spacecraft had cost so much; an estimated $813 million, which was nearly four times the original budget for the project, according to NASA's Jet Propulsion Lab. The exorbitant cost and the spacecraft's failure sparked a new move within NASA to create better, faster and cheaper missions that would take advantage of advanced computer electronics and new team management techniques. NASA called it the Faster, Better, Cheaper, or FBC program. In the meantime, NASA's Mars Global Surveyor (MGS) left Earth on Nov. 7, 1996, and arrived at Mars on Sept. 12, 1997. Its mission was extended several times until NASA lost contact with it in 2006. MGS mapped the Red Planet from pole to pole, revealing many ancient signs of water, such as gullies and hematite (a mineral that forms in water). Data from MGS helped NASA decide where to land its future Mars rovers. MGS also took pictures of public interest, including re-imaging the famous "face on Mars." In 1991, the USSR was dismantled and the Soviet space program was inherited by Russia and Ukraine. The Russian space agency continued their quest for Mars with their Mars 96 mission, which launched on Nov. 16, 1996. However, the orbiter, two landers and two penetrators were lost after the rocket failed. On the other side of Earth, the FBC program's first mission was a great success. The Pathfinder lander and Sojourner rover arrived at Mars in July 1997. The lander was the first to use a set of airbags to cushion the landing, and Sojourner was the first rover to trundle around on Mars. Pathfinder was expected to last a month and Sojourner a week, but both remained in operation until September 1997, when contact was lost with Pathfinder. Japan was next to enter the mission-to-Mars arena with Nozomi, which launched on July 4, 1998. The spacecraft made it to Mars but failed to enter orbit in December 2003. Two other FBC missions never made it to the Red Planet. The Mars Climate Orbiter launched on Dec. 11, 1998, and disappeared after arriving at Mars in September 1999, because of a measurement error. NASA's Mars Polar Lander (MPL) and two space probes with it (called Deep Space 2) were launched on Jan. 3, 1999. All were lost before finishing their journey, probably because MPL malfunctioned and thought it had landed, so it shut off its engine prematurely. The discovery of ancient water evidence on Mars sparked a renaissance in Mars exploration. NASA's Mars Odyssey launched March 7, 2001 and arrived at the Red Planet on Oct. 24, 2001. The orbiter is still conducting its extended science mission. It broke the record for the longest-serving spacecraft at Mars on Dec. 15, 2010. The spacecraft has returned about 350,000 images, mapped global distributions of several elements, and relayed more than 95 percent of all data from the Spirit and Opportunity rovers. The European Space Agency launched its lander-orbiter called Mars Express/Beagle 2 on June 2, 2003. The lander was lost on arrival on Dec. 25, 2003, but the orbiter completed its prime mission in November 2005 and is currently on an extended mission. NASA's two rovers, Spirit and Opportunity, were sent to the surface of Mars in 2004. Each discovered ample evidence that water once flowed on the Red Planet. Spirit died in a sand dune in March 2010, while Opportunity continued work for nearly another decade. Opportunity fell silent during a sandstorm in summer 2018 and NASA declared the mission over in early 2019. Another NASA orbiter, the Mars Reconnaissance Orbiter, launched on Aug. 12, 2005. It began orbiting the planet on March 12, 2006. The mission has returned more data than all previous Mars missions combined. On Aug. 4, 2007, NASA launched a stationary lander called Mars Phoenix, which arrived at Mars on May 25, 2008, and found water ice beneath the surface. Phoenix's solar panels suffered severe damage from the harsh Martian winter, and communication with the $475 million lander was lost in November 2008. After repeated attempts to re-establish contact, NASA declared Phoenix broken and dead in May 2010. The damage was confirmed in orbital photos taken at the Red Planet. The Russian space agency, Roscosmos, made another attempt to reach Phobos with the Phobos-Grunt mission, which launched in 2011 and crashed Jan. 15, 2012, after failing to leave Earth orbit. Phobos-Grunt was also carrying China's first attempt at a Mars orbiter, along with an experiment run by the U.S.-based Planetary Society designed to study how a long journey through deep space affects microorganisms. China’s orbiter also did not succeed in its mission. NASA's more powerful rover, called Curiosity, arrived at Gale Crater in 2012 to search for signs of ancient habitable environments. Its major findings include finding previously water-soaked areas, detecting methane on the surface and finding organic compounds. Opportunity's design has inspired another rover, temporarily called Mars 2020, which will continue with more advanced investigations when it arrives on the Red Planet. NASA sent the Mars InSight to the Red Planet in 2018, and the spacecraft safely landed that November. As of early 2019, the lander is setting up its instruments to examine the interior of Mars. India became the latest nation to successfully arrive at Mars in 2014, when MOM (Mars Orbiter Mission) successfully arrived in orbit. The spacecraft is far enough from Mars to image the entire planet, and it has already transmitted many images back to Earth. For its part, the European Space Agency plans to return to Mars with two missions later this decade. The ExoMars program, which is a collaboration with Russia, launched an orbiter called the Trace Gas Orbit (TGO) and a demonstration lander called Schiaparelli in 2016. Although Schiaparelli crashed on the Martian surface, TGO is still operational. The next tranche of ExoMars is the Rosalind Franklin rover and its companion lander, which are scheduled to leave Earth in 2020. Check out this historical log of all missions to Mars, according to NASA. Read more about each of NASA's missions to reach Mars.